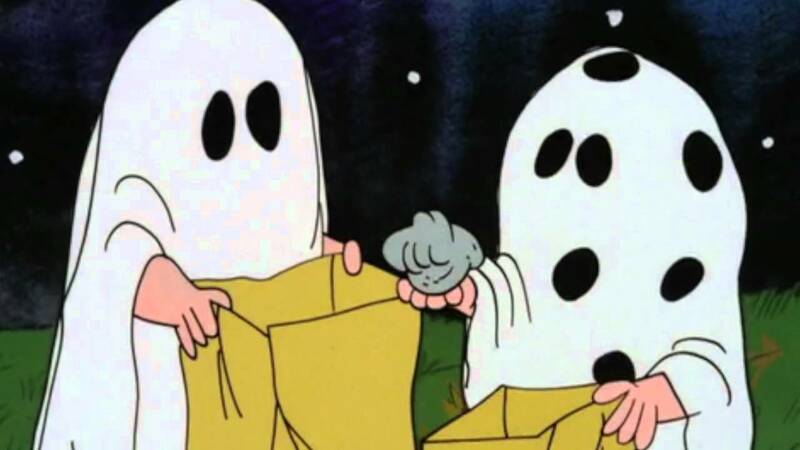 My Halloween Post at the Register: Moar Ghosts! 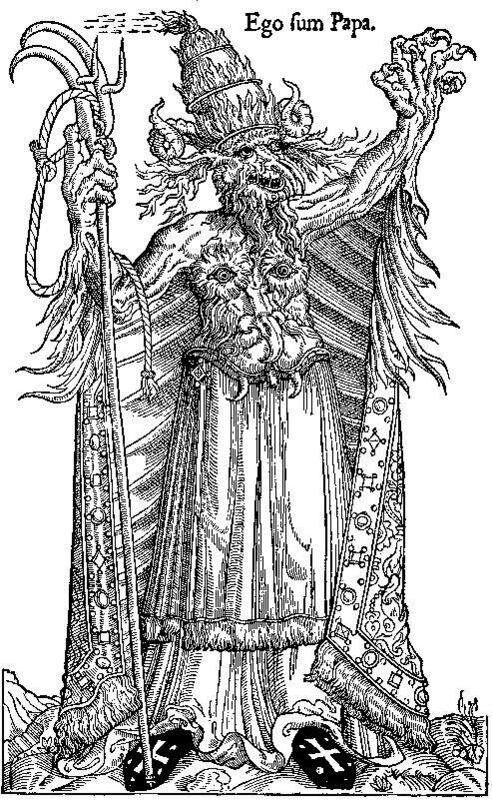 I never get tired of talking about ancient belief in ghosts and apparitions. We’ve reduced ghosts to the trivial or the easily dismissable, from Casper to cranks to dopes on the Discovery channel bumping into each other in grainy green night vision footage. Ghosts stories, however, are not merely told in all cultures: they’re quite prominent. There’s a very simple reason for that: the ghost story points to the afterlife, and we want to know what lies beyond that dark veil that separates the living from the dead. I’ve written about Augustine and Evodius before, but recent reading has deepened my appreciated for their exchange and changed my perspective a bit. We know what we believe. At the point of death, the soul is subject to the particular judgment, and either is ushered into the divine presence or damned for all eternity. Those who die in their sins, but not in mortal sin, undergo a purgation: a cleansing to make the soul worthy to enter the courts of the Lord. Since Augustine, we’ve understood this as a process with a temporal element, despite our understanding of a God who transcends time. It allows us to grasp the ungraspable and imagine the soul after death as embarking upon a journey, helped along by our prayers, alms, and devotions. But what is it like, practically? Anything we use–vision, light, pleasure, notions of place, etc–rely on material to make them function, which why we understand them metaphorically. That wasn’t the case among many early Christians. In giving alms, many believed they wereliterally transferring treasure to heaven. In book four of his endlessly fascinating Dialogues, St. Gregory the Great describes a vision of the afterlife in which a mansion made of gold bricks awaits a rich man who gave away his money. The problem of the fate of the soul exercised the mind of Augustine, but he was content to draw a veil over much of it and acknowledge that we simply cannot know all the details of how a soul leaves the body at the point of death and enters into eternity. But the fate of the soul was of immense and pressing interest to his flock and his correspondents. He was besieged with questions about it from people who wanted to know if their actions, customs, and rituals were effective in protecting the soul after death and seeing it safely to heaven. St. John Plessington was executed in 1679 in England for the crime of being of a Catholic priest. 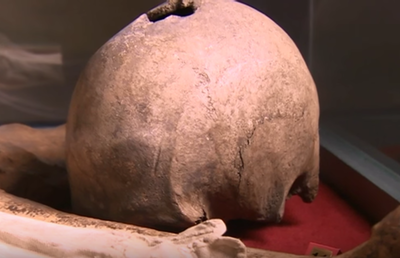 Now, the Diocese of Shrewsbury, England is hoping to raise funds for a DNA test to prove that some bones found in a pub long ago are, in fact, those of the saint. St. John was killed in a wave of anti-Catholic violence triggered by the Oates Plot: a largely forgotten corner of Catholic history. The incident, also known as the Popish Plot, takes its name from Titus Oates, a bizarre figure who skipped from one strange incident to the next, leaving chaos and death his wake. He was a prolific liar and fraud, and motivated not so much by ideology as by a desire to cause chaos. Great Moments in Reformation History! 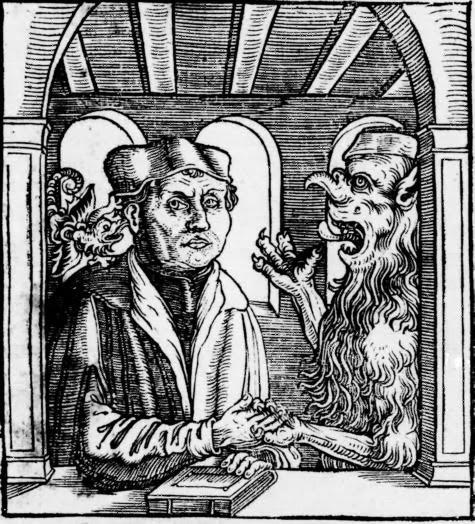 Medieval gossips claimed that Luther’s mother was seduced by a demon disguised as a jewelry merchant, and that the demon then counseled Martin throughout his wayward journey into heresy. After a visit to Rome, so the stories go, he felt shabbily treated and asked his father how he could get his revenge. “Write a commentary on the Lord’s Prayer,” was the demon’s suggestion. Another legend tells of where Luther got his new ideas. One night a monk visited him in his chamber and asked him about papal errors. The monk persisted for some time until Luther noticed his taloned hands and ejected him. (See print above.) The monk-demon vanished with (I am not making this up, although someone else might have) a thunderous fart that stunk up the room for days. There’s an interesting biographical element to these stories: Luther did claim to be harried by demons for much of his life. There’s a story of him throwing an inkpot at one, and others of his scatalogical, poo-flinging battles with Satan. And here we are in 2015, with Germans still making trouble for the church. Iron Mountain is a vast seris of vaults dug deep into mountain rock near Pittsburg, PA. 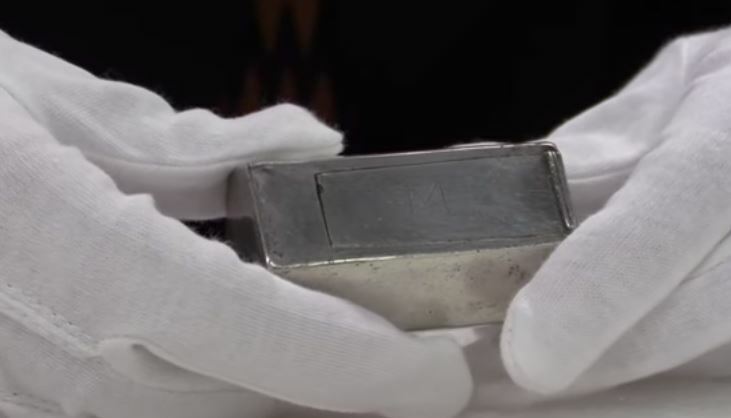 The size of the thing really boggles the mind, as does the many treasures hidden inside. Inside they found fragments of bones (obviously relics) and a holy water ampulla. 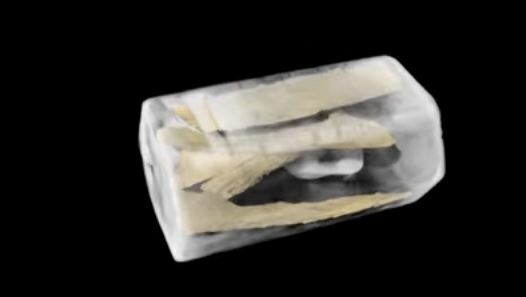 This is a 3D recreation of the inside. Archer was an important leader who was there from the beginning until his death in the harsh winter of 1609/10, when he was given a respectful burial at a time when other settlers may have been reduced to cannibalism. Jamestown was a Protestant colony, and at the time it was founded Catholic recusants, such as Archer’s father, were being persecuted back home in England. Bringing the scourge of popery to the first permanent English colony in the new world would have been extremely unusual. James Fort was founded only two years after the Gunpowder Plot and the Papal Recusants Act requiring Catholic to take the Oath of Allegiance denying papal authority over the king. James I may not have been a monster like Elizabeth I, but he hardly would have wanted to plant Catholics in a new world that he was trying to seize from the Spanish. Catholics were never to be trusted. But now we know that Catholics were at Jamestown. 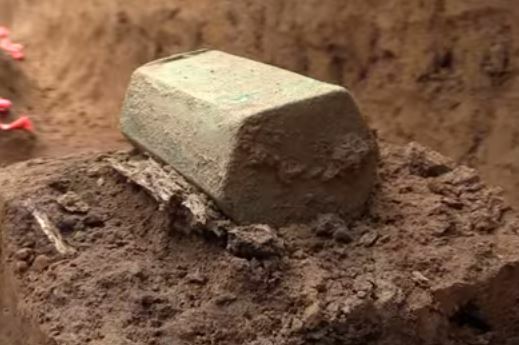 The recent excavations have uncovered rosary beads, a crucifix, and holy medals. Remember that the Reformation in England was not driven by a groundswell of popular belief, but imposed by a tyrant on a population that was fiercely Catholic. Remnants of Catholicism went underground. And some, it appears, made their way to the new world. You may be surprised. While there are certainly stories about knights who drowned in shallow water because they couldn’t stand up in armor, that wasn’t the norm. 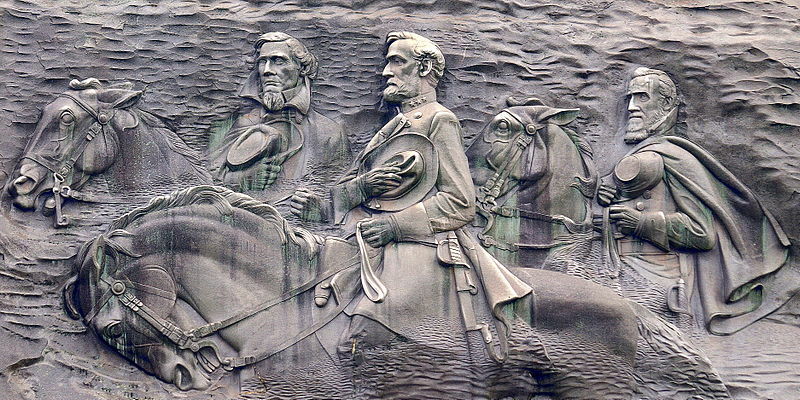 The figures of Jefferson Davis, Robert E. Lee, and Stonewall Jackson carved into the face of Georgia’s Stone Mountain form the largest bas-relief in the world. That they also depict three men who took up arms against their nation and helped plunge this country into its bloodiest period in history, all in the name of a vile institution that even a moral idiot could see needed to end, is one of those disturbing and uncomfortable facts of history. But it is a fact of history, just like the Southern states’ conflicted regard for their own past, with pride in those who fought for their homeland running headlong into the demonstrably evil cause for which they fought. History is complex and ugly. I’m happy if your ancestors were always on the right side of every fight. Not every American’s were, and the monuments littering Southern states testify to a troubling history that mixes pride, shame, and, yes, pure racism. Some of these monuments and flags were made to defy efforts for racial equality and express contempt for black Americans, while others were simply a way to remember political and military leaders who mattered to the community, and whom the people thought should be remembered. I’ve never been part of a people conquered in war. I can’t speak to the psychological dynamics that cause a defeated people to raise up monuments to their heroes, but it’s real and it’s there and we don’t make it go away by engaging in acts of historical revisionism and erasure. I don’t think any flag of rebellion should be flying above any government building in this country, period. Either they’re rebels or they’re Americans. They don’t get it both ways. They lost a long time ago, and they needed to be corrected again when they tried to deny the basic human dignity of black people during the civil rights era. We’ve come a long way since then, and flying rebel flags is a rebuke to the entire country. But as with so many things, people always go too far. Lowering a rebel flag from a statehouse is the right thing to to do. Stripping confederate symbols from gift shops at historical sites (as they did in Gettysburg) or removing The Dukes of Hazzard from TV are merely the acts of frightened and ignorant children. Modern American society can’t seem to find the line between reacting and over-reacting. History is complex and messy and unyielding. We can’t erase it, and attempts to blot out the unpleasant parts only increase the risk of our forgetting them entirely. We certainly shouldn’t do it for purely emotional reasons. But now the Atlanta NAACP is calling for the bas-relief on Stone Mountain to be blasted away: a carving that is the work of Gutzon Borglum, and therefore part of our creative heritage. People see different things in Stone Mountain. Some see good men and strong leaders fighting for a bad cause. Others may see heroes of white supremacy and view the monument through a lens of race hatred. I won’t presume to imagine what black people think of it. Pain? Racism? Derision? Or merely indifference? Given our nation’s historical illiteracy, with a majority of high school students unable to name our first president, I doubt one in a hundred people even know who’s depicted or what they did. This diversity of emotional responses is itself held in suspicion by the social justice warriors. Nuance and complexity is frowned upon. Everyone must have a uniform reaction, disapproving of the Designated Bad Things and approving of the Designated Good Things. Thus, Nelson Mandela is always good, despite the complexity of his life and past support for violence and communism. Nathan Bedford Forrest is always bad, despite his sincere attempts at racial reconciliation late in life. The grays vanish under the progressive censor’s revising brush, leaving only dastardly villains and angelic heroes. 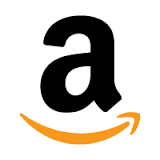 Beware the iconoclast, because once started, they never stop. Today it’s Nathan Bedford Forrest and Stone Mountain. Tomorrow it’s Bl. Junipero Serra or George Washington or Thomas Jefferson. 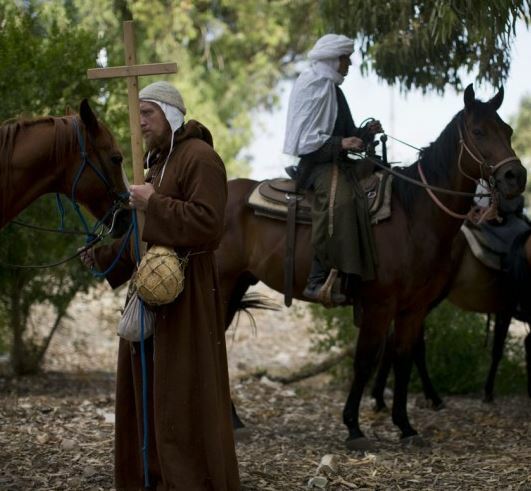 Last week, a group of Russian and Israeli history buffs and reenactors staged the Battle of Hattin, in which Saladin routed the Crusader Kingdom of Jerusalem near the same extinct volcano in Israel where the original battle was fought July 3rd and 4th, 1187. “It’s a direct way of connecting to history, not through books and not through the computer,” said Genadiy Niznik, who organized the event and heads the only Israeli chapter of the “living history” trend. Read the whole thing to see some great stills from the event. 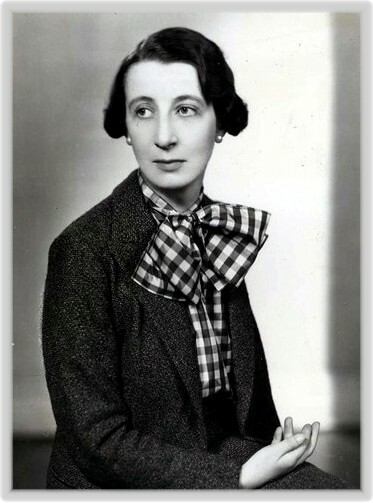 The elusive Miss Tey, one of only a few photos of her. 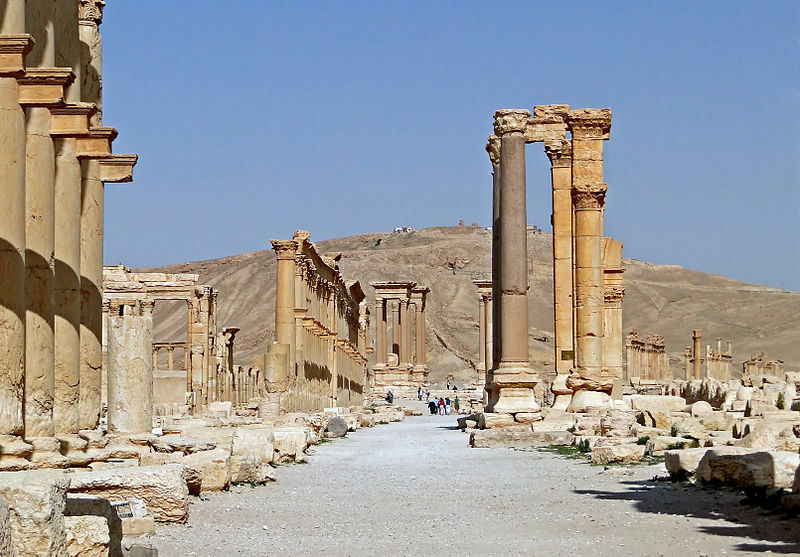 It stood at the entrance the Temple of Bel in Palmyra, Syria, and dated to the First or Second Century. It was a product of the great Palmyran civilization, which had a brief but prosperous glory while the Roman Empire was beginning its decline. It was built in honor of Al-Lat, a pre-Islamic goddess. 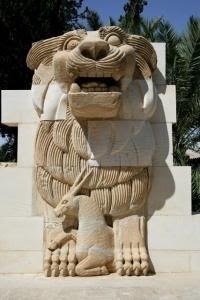 ISIS has taken over Palmyra, which has a rich cultural heritage, and begun a systematic destruction of all “idols.” Eyewitnesses have described the destruction of the lion with construction equipment, as well as the smashing of cultural treasures in the museum. 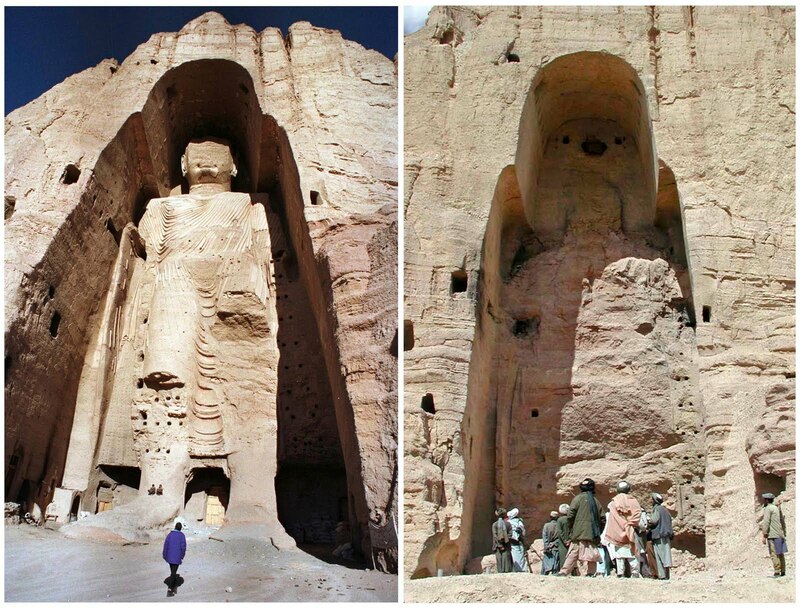 The ISIS forces have promised locals that they will not destroy mere ruins, only “idols.” No one believes them.